For Moto G (including Moto G 2nd Gen), the SIM card slot is under the back cover. So, to insert SIMcard, you must remove Moto G back cover. In addition, micro SD card slot in Moto G 2014 is also under the back cover. You have to remove the Moto G back cover to put in your SD card. However, for many new Moto G or Moto E owners, it can be frustrating to find the correct way to remove Moto G back cover due to Motorola’s unique design for the back cover. You cannot peel off the Moto G back cover. Please follow this guide if you want to remove Moto G back cover properly. Otherwise, you may damage the back cover. It is recommended to remove Moto G back cover only when the the phone is powered off. To power off Moto G, press and hold the power button and follow the on-screen instructions. You need turn Moto G upside down so that the USB port is facing up. This is the most comfortable orientation to take off Moto G back cover. Anyway, Motorola design it in this way. Step 3: Put your finger in the USB charging port as shown below. Step 4: Press your thumb of the hand in the center of the back (Motorola logo) as shown below. You need use two hands to remove Moto G back cover. 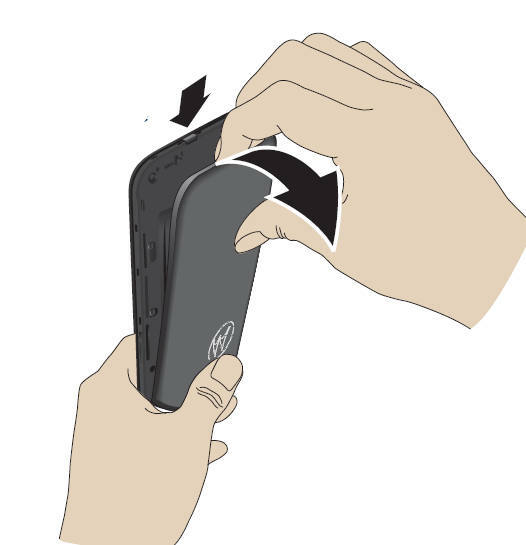 You also need press the Motorola logo hard (apply some force, not just put the thumb there) so that it is easy to pry the cover off. Step 5: Pry the cover off. If you still have problems to take off Moto G back cover, you may check this official video. How about Moto E back cover? Moto E back cover shares the similar design of Moto G back cover. So, you can remove Moto E back cover with the identical method mentioned in this page. This applies to both Moto E and Moto E 2nd Gen (Moto E 2015). Can you remove Moto G back cover or remove Moot E back cover now? If you have problems or questions to remove Moto G back cover or to remove Moto E back cover, please let us know them in the comment box below. Hi I have a moto e5 and even after watching a YouTube video of it I still can’t open it. This is insane!!!! Can I take it to a store that sells tracfones. Is there another way to open this? Why do you want to remove the back of Moto E5? The back of Moto E5 (and E5 plus) is not removable. However, Moto E5 Play has a removable back. You need to find the notch near the bottom. You can then slowly pry the back cover off from the notch. This Motorola Moto G6 is easily the worst PoS phone I have ever owned. Horrible design overall. Never seen a phone where even opening the rear cover is so difficult. All I need to do is add a SD card, so I can finally get my contacts loaded (Motorola will not pull contacts from Verizon like my previous LG, Samsung, etc. I have given up trying) I may have no choice but to simply break the rear cover off and look for a replacement later. Cannot open the back of MotoG5. tried hard but in vain. please show the easy method to remove this cover. Please note, you can remove the back cover of G5, but NOT G5 Plus. For Moto G5, you can find the notch next to the charging port on the bottom right hand side. You need to start from the notch to slowly peel off the back cover. The guide is for older Moto Gs. We will update this page later. You cannot remove the back cover of Moto G6 play (and Moto G6 and G6 plus). It is not removable by users. You need a heat gun and a few special tools to remove the back cover. Why do you want to remove back cover of Moto G6? You cannot change anything inside unless you are very, very tech-savvy with some tools. I have just bought a motog5. Getting the cover off was a genuinely painful experience even using the proper little indentation thing. This is literally terrible design. I’ve also slightly damaged the phone in the process. Moto G 5 actually is a bit easier. You just need to put your fingernail in the notch next to the charging port, then peel the back cover off. Just like all above I can NOT get the cover off. The cover in the instructions is NOT the same as on my Moto G5. Can’t change my SIM Card, so how the hell am I supposed to use my phone……!!!! This page is for old Moto G.
For Moto G5, it is easier because there is a small grove for you to start as explained in this guide. I lost all my nails and was enormously frustrated too. But then saw a YouTube video that makes it clear that THE INSTRUCTIONS ARE WRONG. DO NOT USE the USB Charging Port slot to attempt to open the phone. Use the small slot that is to the right of the USB port. Then it comes right off!! For newer generations of Moto G, there is a small gap for you to peel the back off (if back cover is removable). Went from a g4play which was easy to open to this nightmare! Taking mine back after having for 4 hours! Older Moto Gs are harder to open the back cover. Which generation is your Moto G? G2, G3? Which generation of Moto G? Same here. I simply cannot believe that this device made it to the shelves with this impossible issue. What a joke. Returning mine, giving a horrendous review! So disappointed. Just purchased the Moto G5 and I can’t get the cover off. Can’even keep trying to get it off at present as my finger tips are so sore from attempting to. Why make it so difficult? Moto G5 should be easier. There is a gap in the top and you can peel the back cover off from there. Omg! Its so difficult i couldnt remove the back case. Just got my phone, and have been working hard to try to get this cover off. I don’t want to use tools, but think I’m going to have to! Ridiculous. I can’t do it. What now? Finally have done. Black Mark for the designer. Enjoy the toy. If you try it a few more times, it will become easier. Why design a back cover that’s so hard to remove. What about people who do not have strong fingers and hands. Not very inclusive or accessible. It is actually not so difficult to open the back cover if you get used to it. The timing and force when pressing the logo are important. Anyway, users are not supposed to open the back cover often. “often”?!? I’m only trying to do it ONCE, to add my old SIM card, like the instructions say!!! I am LIVID!!! WTF? I’m 6’5″ and cannot open this damn thing!! Which generation of Moto G? You need press the Moto logo a bit when you try to open the back cover in old generations of Moto G.
This is a nightmare. I have ripped my fi ngers to shreds and the cover won’t budge. Why is it so damn hard? You need to press the Moto logo when trying to removing the cover. WE ALL KNOW ABOUT PRESSING THE BLOODY LOGO!!! IT STILL DOES NOT WORK. please please post a YouTube video ASAP to show us that this is humanly possible. Which generation of Moto G are you using? I have just spent at least two hours and damaged several fingernails trying to do this. It is a brand-new SIM-free G5 bought online from Argos – the battery came separately packed. It is the most useless piece of junk I have ever bought. The designer deserves to be shot – or worse. I phoned Motorola Support and got a charming young lady who, nevertheless, was no use at all. (Spent 5 minutes saying “No this is not a G5 +’).